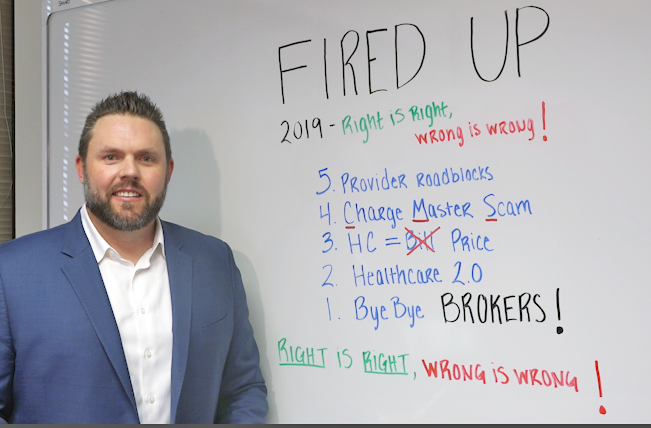 Why Is John FIRED UP in 2019? Read, Watch and find out! Be relevant or become irrelevant. Healthcare providers need to become more open to new reimbursement models. They have become so accustomed to being paid through a large insurance carrier’s TPA and network that they are often unwilling to accept payment through a self-funded, reference-based pricing (RBP) model. Even when the employee’s company healthcare plan will reimburse them at 130% of Medicare for physician services (unlike the large carrier networks who often reimburse the same physicians below 100% of medicare via BUCAH network), they remain skeptical because we don’t have a BUCAH seal on our paperwork and at the same time complain about how low the reimbursement level is via PPO network contract. The thing is, providers do take cash payments today and the uninsured’ payments, so why do they resist taking ours? They lose out on money, the large TPA networks profit, and the healthcare system doesn’t move forward. Providers need to be open to and educated about new reimbursements models in 2019. Providers need to understand their worth, stop being help hostage by PPO networks who don’t value their services. On January 1, 2019, new CMS rules went into effect requiring healthcare organizations to post their standard procedure pricing information. This is a great step forward for our industry, considering hospitals have long hid behind the black box of their ChargeMaster list for pricing. Having the information publicly available gives us a tiny window into hospital pricing methods and is helpful for negotiations and litigation. However, it’s not enough by itself. We need thorough discussion about transparency and dialogue about this newly available hospital pricing information. One of the largest problems that plagues healthcare is the lack of a free market. Most of the time, an amount paid by a member or plan does not match the ChargeMaster amount. In some cases, it doesn’t even resemble it! We must demand explanations from hospital billing departments, and think carefully about how we can leverage the CMS rules to bring competition and transparency back into our industry. This is easily the number one problem in healthcare. There is so much waste and mismanagement. The process is so convoluted. It is difficult for even trained professionals to vet hospital bills to ensure accuracy, fair and reasonable charges, and fiduciary compliance on the employer-side. We need to hold hospitals to account on what they charge and why. Every unexplained or unverified charge that we challenge on behalf of our clients brings us one step closer to driving that accountability, and fixing healthcare. There’s never been a more exciting time to be in healthcare. Hospital CFOs now have to rethink their ChargeMaster since they have to publish it. BUCAH carriers are coming out with their own versions of Reference Based Pricing (RBP). Some healthcare providers are agreeing to bundled pricing. More and more employers are waking up to the waste within the healthcare industry, and how they can avoid it by seeking out a trusted advisor. Even as healthcare is budding with new developments day-by-day, we must remain vigilant in guiding its growth along the right path. Hospitals being required to make their ChargeMaster public doesn’t, by itself, change much. BUCAHs incorporating RBP might just be an attempt to make providers comfortable with their version of an RBP system, not to mention RBP is only a means to an end to fixing healthcare, anyway. How many more 7-12% year-on-year healthcare price increases will it take before the majority of employers aren’t willing to put up with it? The tipping point is inevitable – and imminent. The broker industry is crushing itself under its own weight. Independent, fee-only advisors that reduce costs, improve healthcare quality and access, and bring real value to the employee benefits process will prevail. We can hasten this process by advising employers on purchasing healthcare instead of merely selling them insurance. Our industry needs to recognize the difference between healthcare and health insurance. Then, we need to close that gap rather than ignoring it and pretending it doesn’t exist. You’re either ahead of the curve or behind it.